So, I'm looking to create some custom M&M minis from HeroClix, but I'm not terribly familiar with all of the sculpts out there. I could use some help finding the right raw materials (i.e. figures to chop up) for my custom creations. Since, I am something of a novice at this, I'll need relatively cheap, easily found figures with some specific characteristics. Sculpting anything myself (like with clay) is a last resort. Can anyone here point me in the right direction? OK, the first thing I'm looking for is a relatively bulky figure in a trenchoat or labcoat. In my initial search, I found some Hellboy sculpts that might fit the bill, but most are a little pricey for my needs. Also, the legs aren't quite what I want, and I'm not sure how easy it would be to dig his lower limbs out of the coat for replacement. Still, the scale is pretty close to what I'm looking for. Any ideas? Second, I'm looking for a figure holding a baseball bat or club, preferably in the right hand. I've seen some sports clix that look like they might work (specifically Ichiro), but these seem difficult to get a hold of. I'm currently winning an ebay bid for the aforementioned Ichiro figure, but it'd be nice to have another, in case I ruin that one. 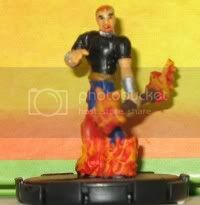 Does someone know a good source of cheap SportsClix, or know of another figure that's got what I'm looking for? Maybe something from Mage Knight or HorrorClix? Last, I could use another trenchoated sculpt with a slimmer build than mentioned previously. Something like the Multiple Man sculpt I've seen, but cheaper. The final result I'm looking for is a character very like The Captain from Nextwave. Anyone tried this one, and/or have some suggestions? Welcome to the wonderful world of clix customising! Frustration and pain await - kidding. Those are the ones that spring out to me. Good luck with your project. argh miniatures conversions they always look awesome in my head, then an hour later I have a pile of broken limbs on my desk :'( lol. If you're really going to make a job of it I can't recomment anything more than I can the green stuff thy sell at games workshops. Its a putty-like material which sets hard and can be painted on. I've only used it for simple shapes myself but have seen others work wonders with it- but it can CERTAINLY be used for your baseball bat guy. Chamber is also a cheap $.49 Heroclix in a trenchcoat. The translucent bit on his chest is easily removable, but you'll probably want to putty or swap the head. Hi there. I'm a Lurker finally joining in! Here's a few Valiant figures I made, and I am a total novice. You might want to look on ebay for people selling large lots of figures, just for spare parts.